AT&T has made even more people than usual angry when it started blocking/filtering parts of 4chan late last night. The popular message board, famous for being able to brew online (and offline) shitstorms like no other web property could, saw portions of its publication – including /r9k/ and the infamous /b/ – blocked for AT&T customers across the United States. Quickly enough, there was a lot of rallying going on, with 4chan members and fans virtually gathering to plot digital riots and all-round mayhem. AT&T went on to say that they contacted (or at least attempted to contact) the owners of 4chan, which Moot vehemently denies. AT&T told CentralGadget that they have specific reasons why they blocked these parts of the site, but they would not disclose them, further stating that they have requested specific things and changes from 4chan’s owners to which they have failed to comply. Meanwhile, 4chan is apparently under DDoS attack, supposedly because of the attention the site has been getting for the past 12 hours. The site is sometimes down, sometimes up but very slow, according to various reports. Note that this is not AT&T’s responsibility and quite possibly even the reason for the company to have made the dangerous decision of restricting access to the message board in the first place. Updates coming, including some of the actions taken by 4chan members and friends to retaliate. Update 1: this thread on Digg (760 votes and counting) pointed to a now-removed fake article at CNN’s iReport about the death of AT&T CEO Randall Stephenson. 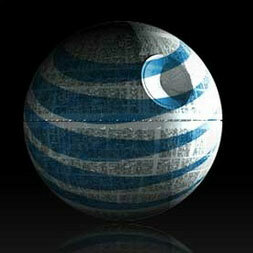 Update 2: there’s pledge up at ThePoint to boycott AT&T and cancel the Internet service with them. In the end, this wasn’t a sinister act of censorship, but rather a bit of a mistake and a poorly executed, disproportionate response on AT&T’s part. Whoever pulled the trigger on blackholing the site probably didn’t anticipate [nor intend] the consequences of doing so. We’re glad to see this short-lived debacle has prompted renewed interest and debate over net neutrality and internet censorship—two very important issues that don’t get nearly enough attention—so perhaps this was all just a blessing in disguise. Aside from that, I’ll also add that there is some big news due later this week. Keep an eye on the News page, Twitter, and global message for updates.